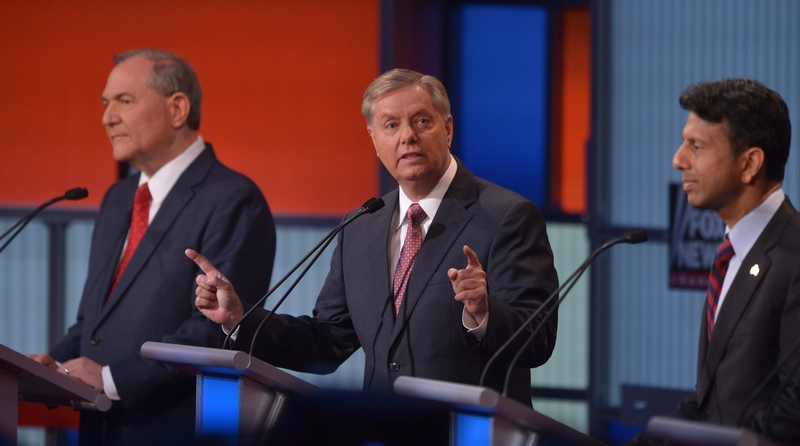 During Thursday night's kickoff GOP presidential forum, Lindsey Graham seemed more nervous than usual. Taking the stage with his fellow bottom-rung candidates — those who were just outside the top 10 slots in national polls — the South Carolina senator's easy southern drawl was replaced with a shaky, insecure cadence, leaving him struggling to keep up with his fellow candidates. Not only did Graham miss out on a few important opportunities to get ahead of the pack, but he also seemed to be running against an invisible candidate, rather than those standing at the podiums around him. "To all the Americans who want a better life, don't vote for Hillary Clinton," said Graham, responding to a question over the increasing number of people on government assistance. Graham then shifted gears, preemptively challenging the policies of a "failed [Democratic] presidency," rather than honing in on his own plan to reduce dependency or to open up jobs for unskilled or entry-level workers — a popular topic among his GOP rivals. Before he could finish curiously discussing his theories on ISIS, the bell signaled that his time was up, leaving the few audience members in attendance baffled by the trajectory of his non-response. It wasn't the only stumble Graham made. At one point during his answer, Graham seemed to grow angry, leaning into his podium and declaring, somewhat confusingly, "If I have to monitor a Mosque to [stop an attempted terrorist attack], I will." The 10-year congressional veteran was late out of the gate when compared to his fellow candidates — including, most notably, former HP CEO Carly Fiorina, who spent the majority of the first 45 minutes swinging hard, pooling statistics, and utilizing international connections to back her arguments. For Graham, Thursday's forum may have been more of an attempt at securing a spot in a future Republican cabinet. But even with his long roster of political accolades and reference letters, his flustered appearance may have caused him to be left in the dust.